Yesterday the doorbell rang. It was the postman with a package for me. I was very excited…I just love packages! We opened it and it was a selfie sweater. 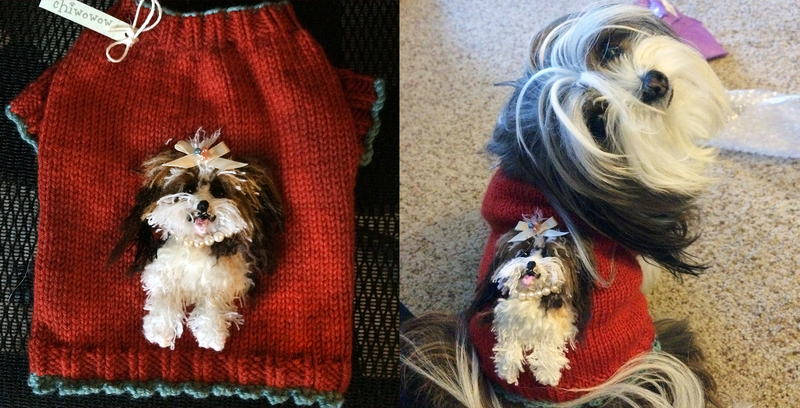 There I was, a little mini-me on a sweater! It even was made to match my orange and teal collar and lead. Now I live in sunny California so there is only a few days of the year that you really need a sweater so my two-legged people have promised me a trip to the mountains when fall arrives to see something called snow. I have no idea what this thing called snow is but I am packing my sadie selfie sweater when I go. If you are interested in a selfie sweater of your own you can contact Paula from Chiwowow. A unique gift for any pet!